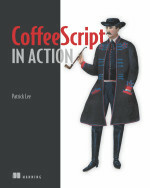 I recently finished writing a book on CoffeeScript. At 432 pages it is long relative to recent tech-book trends. It is especially long for a CoffeeScript book. That is because it covers a lot of material (ok, and admittedly has two pages of cartoons). I have a vague sense of irony though, so I’m giving away a free copy of CoffeeScript in Action to the best (judged by me) “CoffeeScript in a Tweet” (newlines welcome) submission by a SydJS attendee on Wednesday, 21st May. To enter, just tweet it, cc @boundvariable and attend SydJS. Why call it Bound Variable? I'm the author. Get it from Manning. Somewhere on the edges of code, user interface and philosophy.